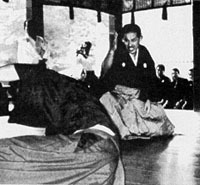 The Hakkoryu Jujutsu tradition was founded by Okuyama Yoshiji after decades of martial and medical studies. In Japan, the establishment and perpetuation of combat systems has traditionally been done through the founding of a ryu (school or system of martial arts). The first-generation headmasters (Shodai Soke) of these fighting styles were often martial geniuses who, through serious study, practical experience, austere discipline and native insight, devised systems of combat which most effectively protected them and their clans against violence.Reference to individual ryu did not appear in Japan until after the Age of Warring States in the 1500s. During this period, feudal lords (Daimyo) solidified their power and established sometimes unstable domains. Master teachers of the bujutsu (warrior arts) were sought out by daimyo and employed to instruct soldiers in various forms of combat. Because no one individual could be outstanding in all forms of combat, daimyo might employ a number of masters representing various ryu. Some ryu might even have subsystems within their curriculum. 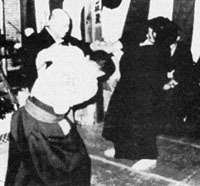 There were ryu that were restricted to certain classes of warriors, and ryu restricted to specific domains, and still other systems that were founded completely outside of the warrior class.One-on-one master/disciple training, such as that conducted below by Hakkoryu founder Okuyama Yoshiji (right), ensures that each student in the system is highly trained. Jujutsu ryu, for example, were almost always considered secondary systems in ancient times. This was primarily due to an underlying assumption that a warrior’s major implement of combat was his sword, and, to a lesser extent, various other accessory weapons. Jujutsu, of course, was basically an empty-hand system of combat, eschewing most weapons. Only when a jujutsu ryu was founded by commoners did the system flourish, and this was very rarely the case until after the collapse of feudalism in Japan in 1868. At that time, the warrior class was abolished, the sword fell into disuse, and the interest and common need arose to concentrate on unarmed tactics. It was in this environment that Hakkoryu Jujutsu and its predecessor, Daitoryu Aikijutsu, were developed. Entrance to old ryu, including those of jujutsu, was-and still is-restricted. Recommendations and introductions are required. Visitors to Hakkoryu headquarters in Omiya City, Japan, without proper credentials, are turned away. Not all headmasters are approachable because of the frugal, remote and uncompromising lives they lead. With regard to training, ryu headmasters are guided by the concept that it is always preferable to train a few students well, rather than many students not so well. One-on-one master-to-disciple training is still the common method in traditional ryu. This policy, while restricting the breadth of a ryu’s following, certainly ensures its depth. Because a ryu’s reputation depends on the performance of its exponents, the headmasters clearly realize that any compromise of this method would eventually lead to the ryu’s decline. In ancient times, once accepted by a headmaster, a disciple took a blood oath (Keppan) in which he swore to protect the secrets of the ryu under the threat of death. In modern ryu, like the Hakko jujutsu system, entrance requirements are less strict, but an oath is normally taken which binds the disciple to protect and keep confidential the ryu’s teachings. More for practical than secretive reasons, such an oath serves two purposes. First, it warns new disciples that they will be held accountable for unnecessary use or abuse of the ryu’s techniques. Second, it informs disciples that, until properly certified and authorized, it would be best if they avoided embarrassing themselves and the ryu by discussing and perhaps showing techniques which they have not thoroughly mastered. The system’s current headmaster Is Okuyama Toshio, the son of Okuyama Yoshiji. Hakkoryu headquarters is based in Omiya City, Japan. Following acceptance into a ryu, the tehodoki (hands-untying period) begins, during which the disciple’s dedication, patience and pliability will be tested. The newcomer will be expected to submit to the needs of the ryu. Traditional Japanese ryu were not, and are not, democratic structures. The ryu is autocratic at its center, and the directives of those in leadership positions are to be willingly followed, with the appreciation and hope that doing so will best serve the needs of the ryu. In Hakkoryu, current headmaster Okuyama Toshio, together with various advisory councils, oversees and decides on all major matters impacting the-system. Significant deviation by disciples from set policy typically results in disciplinary action, and sometimes expulsion. In ancient times, death might be the consequence of a serious breach of the rules. Fortunately, such extreme measures are virtually unheard of today, replaced by expulsion in most ryu. A thorough grounding in omote (surface techniques) is required of all new ryu disciples. Kata (choreographed combat sequences) practice is invariably at the center of such training, and much time is spent living and breathing the kihon waza (basic techniques) of the forms. These techniques embody the wisdom and experience of the ryu’s founder and are to be handed down as they are, without change, to successive generations. Each ryu has its own characteristic techniques which reveal the genius of its founder. In Hakkoryu – founded by Okuyama Yoshiji after decades of martial and medical studies- the omote consist of four kata: first degree (Shodan), second degree (Nidan), third degree (Sandan), and fourth degree (Yondan). Each kata corresponds to a black belt level and builds on the previous form, creating a stronger, more diversified, more flexible whole. Mastering the omote is not to be rushed, for inevitably the resulting damage will make itself evident. The essence of the techniques will always remain elusive to those who have not undergone prolonged study of the basics under a qualified instructor. Hakkoryu Jujutsu founder Okuyama Yoshiji presents a makimono hand scroll to one of the system’s master teachers. 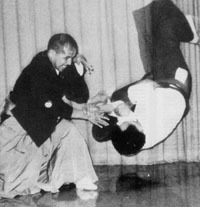 Eventually, if selected by the headmaster, a disciple will be exposed to the hidden points (Higi) of the ryu and its secret techniques (Okuden). Such selection is initiated through the recommendation of Hakkoryu branch masters. The headmaster then decides who to invite and sends a personal invitation. Although this advanced training offers new insights and options while exposing a student’s limitations, without a firm foundation in the basic techniques, such practice will have little meaning and its real significance will elude the exponent. At a certain level of training, the exponent will be awarded various titles and credentials of proficiency. These will typically include a formal certificate (inka) and hand scroll (makimono). 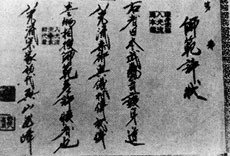 Both include a proclamation that the disciple has achieved a specified level of skill, but the latter document also lists and describes techniques as well as philosophical passages of importance to the ryu. The ryu hand scrolls are closely guarded to prevent them from being revealed to outsiders, although even if they should fall into outside hands, their meaning would be obscured without considerable training. Hakkoryu makimono are very difficult for even well-educated Japanese instructors to understand because they were assembled by the founder using an unusual 18th-century writing style. Hakkoryu has three advanced levels, all requiring extended residence at the headquarters school in Omiya City. 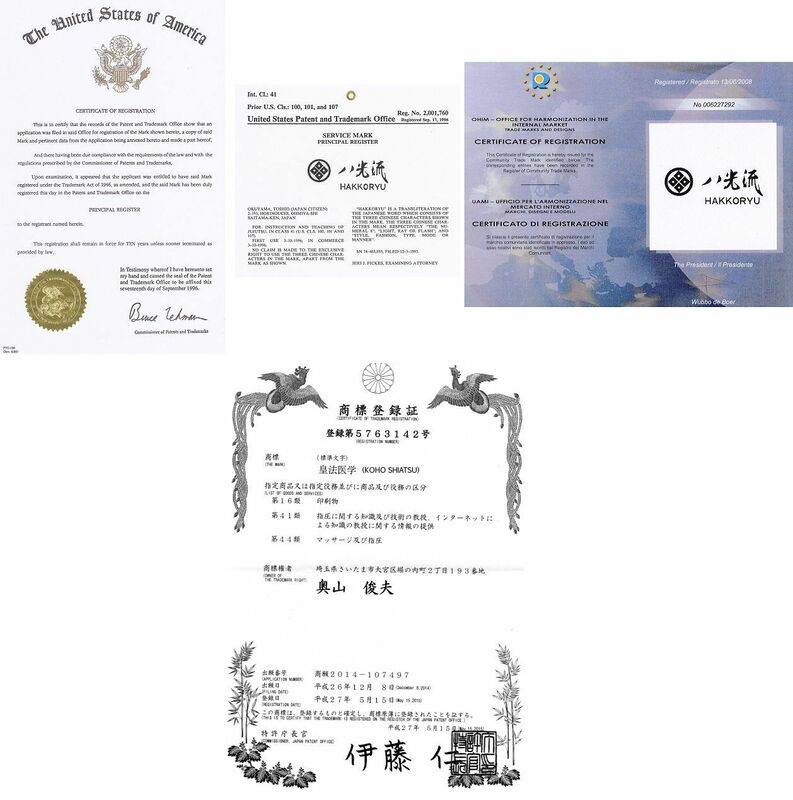 These levels are known as “master teacher” (Shihan), “master teacher of all mysteries” (Kaiden Shihan), and the “three great foundation pillars” (Sandaikichu). 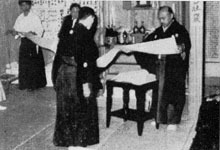 Disciples who complete these levels may also request review sessions with the Hakkoryu headmaster and, upon successful completion, will be awarded the title “polished master” (renshi) All but renshi-level Hakkoryu practitioners are awarded a makimono, and all but Sandaikichu-level practitioners receive an inka. Makimono and inka are credentials of proficiency given to senior instructors. The makimono describe a system’s techniques and are closely guarded to prevent outsiders from viewing their contents. Ryu may either be family-operated systems, passed on from one generation to the next, or non-family systems, where the headmastership is transferred to a worthy disciple. Subsequent generations of headmasters assume the responsibility of preserving the ryu in its original form, as designed by the founder. This obligation imbues later headmasters with a certain resistance to change, not because they are unskilled or unable to devise changes and techniques of their own, but because by assuming the sokeship of the ryu, they have specifically agreed not to change the original system. The Hakkoryu charter reveals that the lineage of the system is not necessarily hereditary. The headmaster can nominate a successor, but the senior councils need to give their consent. Founded in 1941, Hakkoryu is a young tradition, and there have only been two generations of soke, the system’s founder and his son. For non-Japanese, membership in a ryu provides an unparalleled opportunity for exposure to traditional aspects of Japanese culture. While foreign disciples may be accepted as members of a ryu, they would be wise to consider themselves merely special guests who have been given the honor to assist in the care and preservation of a national treasure.